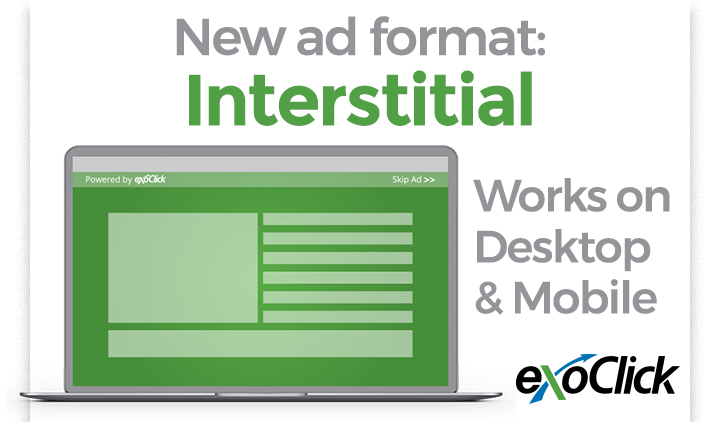 ExoClick has announced the launch of a new interstitial ad format that works on both desktop and mobile. The interstitial is a full page postitial ad that appears between page loads on a website. The postitial is triggered when a user clicks on a designated link set by the publisher. The publisher has the choice of setting the trigger on click links only, all links or specific links. Once triggered and shown to the user, the full screen displays the ad. The top right of the format features a ‘skip ad’ option allowing the user to close the interstitial immediately and view the websites content. The new interstitial is available on the CPM payment model and includes pre set and customisable frequency capping options. Interstitials are reportedly a popular ad choice because of their size, which allows an advertiser to have a larger piece of real estate on a website to promote their product or offer with compelling creatives. Benjamin Fonzé, ExoClick’s founder and CEO, commented: “ExoClick continues to help publishers and advertisers to make the most of their ad space and marketing budget by providing new online advertising solutions adapted to the current changes of the industry. “Our new interstitial format offers both publishers and advertisers an alternative to the popular popunder format. Publishers can get really creative with the triggering and frequency capping feature to find the right balance between advertising and content on their site.